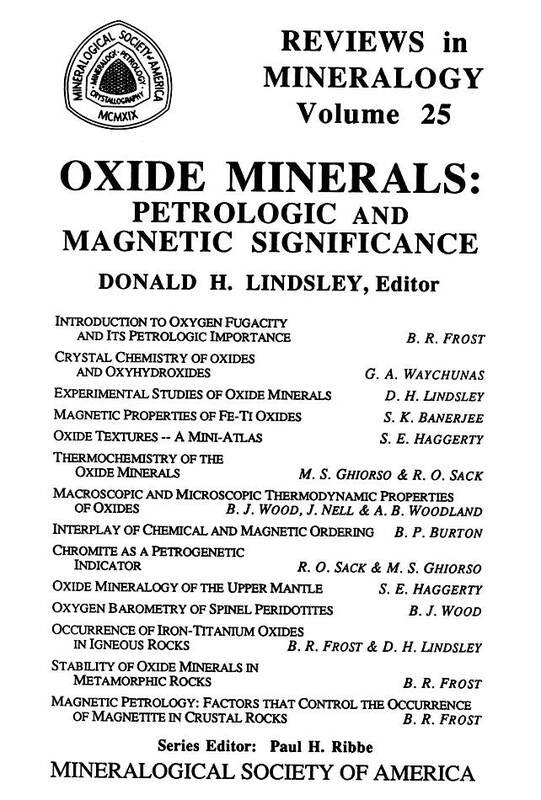 This volume was published to be used as the textbook for the Short Course on Fe-Ti Oxides: Their Petrologic and Magnetic Significance, held May 24-27, 1991, organized by B.R. Frost, D.H. Lindsley, and SK Banerjee and jointly sponsored by the Mineralogical Society of America and the American Geophysical Union. It has been fourteen and a half years since the last MSA Short Course on Oxide Minerals and the appearance of Volume 3 of Reviews in Mineralogy. Much progress has been made in the interim. This is particularly evident in the coverage of the thermodynamic properties of oxide minerals: nothing in Volume 3, while in contrast, Volume 25 has three chapters (6, 7, and 8) presenting various aspects of the thermodynamics of oxide minerals; and other chapters (9, 11, 12) build extensively on thermodynamic models. The coverage of magnetic properties has also been considerably expanded (Chapters 4, 8, and 14). Finally, the interaction of oxides and silicates is emphasized in Chapters 9, 11, 12, 13, and 14. One of the prime benefits of Reviews in Mineralogy has been that any scientist can afford to have it at his or her fingertips. Because Volume 3 is out of print and will not be readily available to newcomers to our science, as much as possible we have tried to make Volume 25 a replacement for, rather than a supplement to, the earlier volume. Chapters on crystal chemistry, phase equilibria, and oxide minerals in both igneous and metamorphic rocks have been rewritten or extensively revised. The well received photographs of oxide textures in Volume 3 have been collected and expanded into a "Mini-Atlas" In Volume 25. Topics that receive less attention than in the earlier volume are oxides in lunar rocks and meteorites, and the manganese minerals. We hope that the new volume will tum out to be as useful as the previous one was.